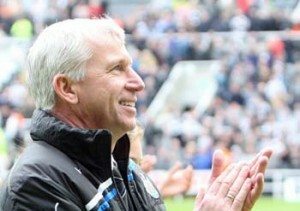 Alan Pardew – Cream or Cheese? The old saying reckons that ‘cream always rises to the top’, well how on earth do we describe the erstwhile Mr Pardew’s performance right now? If gold top full fat milk is the top of the scale and UHT low fat skimmed milk sits at the bottom, how should we rate Pardew’s current performance, or is the situation even worse than we thought, has the milk gone off and is he on the way to making cheese? It would seem his Newcastle career is doing a Charlton, a West Ham and a Southampton…good starts but slowly found out and sacked blaming bad luck, loss of players to other clubs and injuries….ring any bells????? Many in the game were impressed with the impact he made at all the above clubs, every time he comes into a club he seems to make an impression. He’s a smooth talking likeable cockney who if made out of chocolate would have eaten himself many years ago but with his previous track record showing such an obvious trend, you have to wonder why on earth Ashley gave him an 8 year contract? Maybe he knows something we don’t! Just like with all the above he’s slowly being found out at Newcastle too, he’s gone from LMA manager of the year last year to being short-listed just behind Martin O’Neill as the next most likely manager to get the sack. The pressure’s on and he’s wobbling like jelly on a train, he’s been making ill-thought out decisions with regards to formations, team selection and substitutions all year, the man’s in a tail spin and is starting to lose the team, they’ve got that scared rabbit look in the lights of relegation. Look at Moyes at Everton, no money for 10 years, relies on free transfers, low budget players and selling his stars to keep the ball rolling, he has a team that play their hearts out for the club, the manager and the fans – he’s under no illusions whatsoever as to how it is and how it’s going to be. Pardew on the other hand is very simply Ashley’s full-time PR manager and part-time football manager who is taking the fans for fools, three players coming into the club in January my arse! If three players do come into the club in January you can bet only one of one of them will be a purple because whoever it is will be funded by the sale of an existing purple, so there’s no way we’ll be nett three players better off in January. Cream or Cheese? I know what I think!